31 May 2006: The Commission for Looted Art in Europe and the Prussian Cultural Heritage Foundation are delighted to announce that a small 16th century Florentine painting lost in the turmoil of the Second World War has today been returned to the Berlin Gemäldegalerie by the Commission for Looted Art and Charles Wheeler. This is the first time that a work published in the Gemäldegalerie’s catalogue of war losses has been identified and returned to the Berlin museum. The painting is a portrait of Eleonora of Toledo (1522-1562), the daughter of the Neapolitan viceroy and wife of the first Duke of Florence, Cosimo di Medici I. It is attributed to Alessandro Allori (1535-1607), a pupil and foster son of the court painter Agnolo Bronzino, the author of a famous portrait of Eleonora with her son in the Uffizi Gallery. The picture, painted on poplar wood, which at 16cm x 12cm is the size of the palm of a hand, has a varied history of which only elements are known. Initially in the collection of the Berlin Print Rooms, it was assigned to the Gemäldegalerie in 1894. The painting was photographed in 1939, the year in which the museums were closed and the transfers into wartime storage began, and was noted as missing in 1944. Believed lost or destroyed, for the past 50 years it has been safe in the possession of Charles Wheeler, one of Britain’s most distinguished journalists and broadcasters. In the 1950s Charles Wheeler was the Berlin correspondent of the BBC’s German Service. His work brought him into daily contact with listeners in the Soviet Occupation Zone, many of whom were regular visitors to his office. One of them, a farmer from near Frankfurt an der Oder, presented him with the painting as a wedding gift, claiming he had in turn received it from a Russian soldier in barter. Wheeler would never see the correspondent again and the painting has remained with him ever since, unattributed but much loved. For many years Wheeler wondered about the painting’s true story, but the opportunity to reveal its origins only arrived last year when he went to see Anne Webber during research for a BBC programme about the loss of works of art during the Second World War and showed her the painting. He expressed his wish to restore it to its rightful owners if they could be found. Ms Webber and her team undertook research on the painting and contacted a number of German museums and research bodies – and the Gemäldegalerie recognised the painting lost for over 60 years. With the help of its catalogue of losses, the provenance of the painting was confirmed and the Commission arranged its return. Eleonora of Toledo, as the wife of Cosimo I whom she married at the age of 17, lived through the most glittering period in Florence. Her husband, the Duke of Florence, had the Uffizi Palace built, where their son Francesco I was later to establish the famous gallery. Cosimo instructed Giorgio Vasari to transform the Palazzo Vecchio into a splendid residence where Eleonora had an apartment with its own chapel. Eleonora took an active part in Cosimo’s business activities: her husband transferred the affairs of the court to her in his periods of absence, an unusual gesture at that period. In 1549 he bought the Palazzo Pitti for his wife and it became the formal seat of the Grand-Ducal family and the site of the Boboli gardens. The portrait is of high quality, skilfully painted and rich in detail. It depicts Eleonora as a young woman, and was probably not painted contemporaneously. 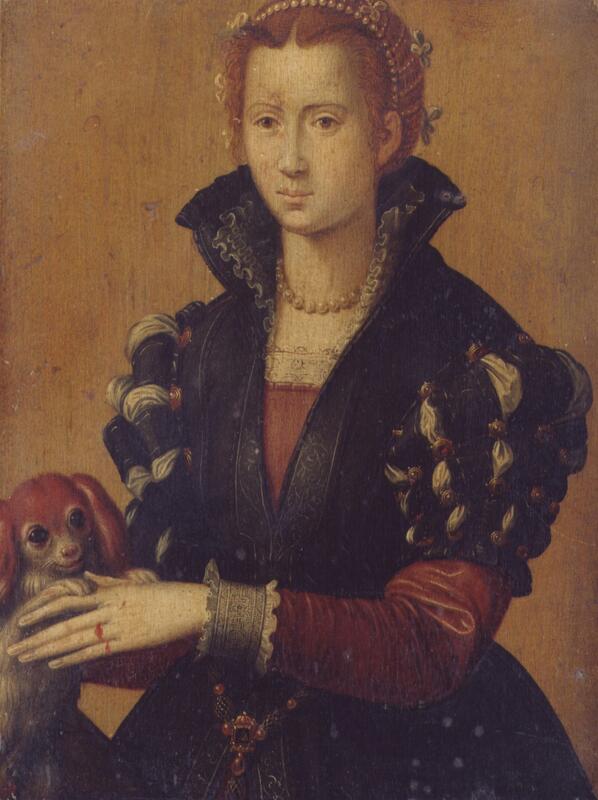 It is possible that it was painted after her death in the 1570s, working from the many portraits of her. Its small size suggests its part in a series of family portraits. The catalogue Dokumentation der Verluste, Band I, Gemäldegalerie, published in 1995, documents over 400 missing works of art. The war losses of the State Museums of Berlin are online at www.lostart.de. The Commission is a non-profit expert body which represents individuals, museums and governments worldwide in the research, identification and recovery of looted cultural property. An image of the painting is available from the Commission.